Join The Gossip: I Scored The Hunger Games Tickets! Over the weekend I purchased tickets to The Hunger Games for opening night! Excited is an understatement. I am giddy...like a child waiting to go to Disneyland. Now the countdown begins. 16 days, in case you weren't aware. I love that LA has movie theaters that offer assigned seating. It's so nice to pick your seats and not have to hassle with crowds and long lines to secure a seat. Do your theaters off this? Premiere nights would be pretty miserable without assigned seating. 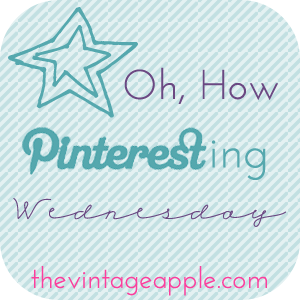 Today I'm linking up with The Vintage Apple for Oh How Pinteresting Wednesday and The Girl With the Blue Bow for What the Hell Wednesday. My what the hell moment centers around the fact that The Hunger Games movie isn't even out yet, but I can't wait for Catching Fire and Mockingjay to hit the big screen. Obsessed? I'd say that's an accurate assessment. Gah, I'm so excited for these movies! I hope they do justice to the books or else I'm gonna be hella pissed. Thanks for linking up again! I can't wait either. Most of Seattle's theaters don't offer assigned seating, I think I need to go to a premiere in LA. I am BEYOND excited for this too!!!! I'm going with a group of friends to see it opening night as well. Midnight showing. I even took the day off the next day to recover. I don't do well staying up past 12 on a weeknight. I would be worthless at work! We got assigned seating at the Garden Walk in Anaheim. Soooo excited! I don't know of a single theatre around here that has assigned seating- which means nights, opening nights specifically are an absolutely misery! I wish we had assigned seating! No more getting split up or sitting in the front row with a neck cramp! aww, so very jealous! and i know that the movie is going to be incredible! i wish our movie theaters had assigned seating. what a genius idea! Such awesome books! I have to admit, I am still on the Gale train! I am glad you had the Katy Perry picture, I saw it and couldn't figure out what it reminded me of! Now I know! i am soooo ready for the movie! My girlfriends and I are going opening day too! Can't wait!! I'm obsessed myself. The kind where you're upset when you've finished reading the series. My 13 yo just finished it as well. Cannot wait for the movie to come out! And no pre-sales here in the north. Boo. Note to self - I really need to read the book before the movie gets released! I finished the first novel a couple of weeks ago and now I can't wait to see the movie. I wish my movie theater offered assigned seating. I love the picture of Katie Perry it's hilarious. I am SO stoked for HG! My friends and I booked tickets a few weeks ago! I am so insanely jealous! Enjoy it lady!! assigned seating?! in a movie theater? WHAAAAAAAA???!!! never heard of such a thing. i need to get on that stat! i still need to read the book!!! I just finished reading this and can't wait for the movie!! I think I will wait to read book #2 after I see The Hunger Games on the big screen! Congrats on scoring tickets, lucky girl!! I have mine too and cannot be more excited!! So jealous of your assigned seats though-- what a fantastic idea! I burst into tears when I see the trailers. What is wrong with me?! I'm so excited! Goodness, I'm jealous. I told myself that I was waiting until the second weekend to go because I know it's going to be crazier than all get out. Have fun though! Yay!!! I can't wait to see this movie!